I have enjoyed all types of skiing since I was a kid. 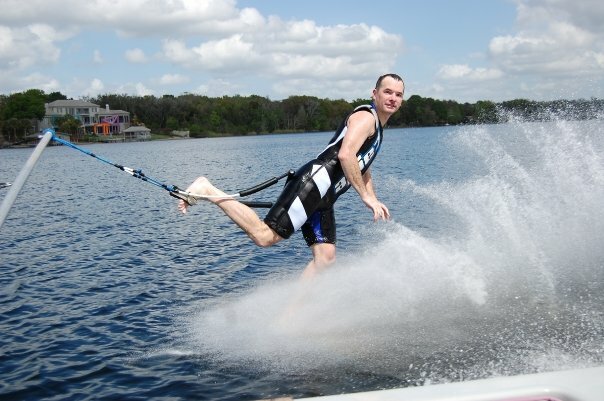 For two summers I worked on the waterski staff at a summer camp and we would barefoot off the boom for fun and to impress the kids. 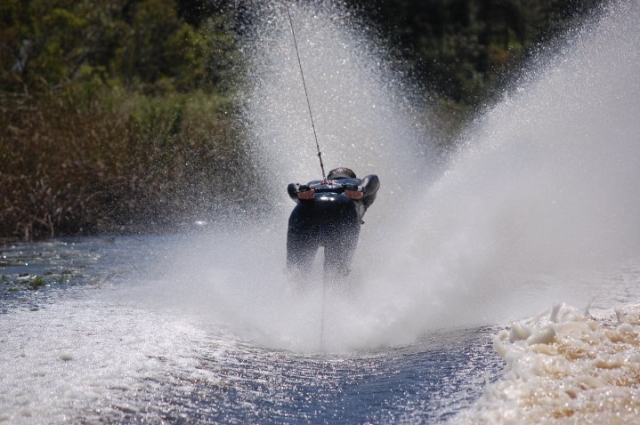 Stepping off of a slalom ski while hanging onto the boom. My first Pro Instuctor would have been Andy Sable while he was working at Ron Scarpa's. It was the 2007 Southern Regionals and I was very nervous. I was the first skier out that morning as I did not have a posted score for seeding. I could only get up forwards so I was planning on doing two front slalom passes. I ran my first pass and everything was fine nice clean two foot crossing like I knew I could do. The second pass I fell on the start because I did not wait for the boat to speed up. 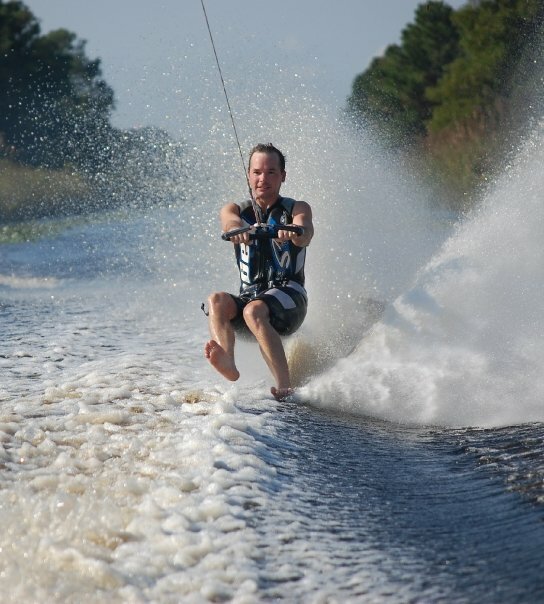 It was the most amazing feeling to be riding on the water on just your feet. I still think that it is the coolest feeling in the world and I never seem to get tired of that feeling. I really enjoy spending the time that it takes to improve in barefooting. It is a very technical sport where things sometimes progress very slowly but I love to set a goal and then spend the time working towards that goal. There have been a lot of people but I would have to say that Mike Holt has inspired me the most. I train with him weekly and his drive to continue to improve is amazing. He is almost 20 years older then I am and he has continued to get better so if he can do it then I know I can as well. KSO-smoothest wake slalom skier I have ever seen; Smallz-the most amazing jumper the sport has ever seen; Scarpa-awesome skier that always seemed to find a way to pull out the win; Fleck-all around great skier that is always smiling; Ben Groen-awesome tricker with very smooth multiple turns. Twice a week almost all year. Getting ready for the 2012 Worlds I went for over a year of skiing twice a week every week. No nickname, I guess I am just not the nickname type. I do a lot of camping and boating with my family. I have a Real Estate Brokers License and I work for a company that manages investment rental properties in Orlando. I am also an Adjunct Professor at a small University in Orlando. I teach Marketing and Business classes online. When one door closes God always opens another.